Due to increasing digitalization, criminal procedure has to take into account the characteristics of the Internet, related technologies and digitally stored or electronically transmitted data. The objective of the dissertation is to examine, building on the example of the Council of Europe Convention on Cybercrime (CoCC), the regulation of remote search and seizure in circumstances where the targeted evidence is extraterritorially located or where it is not possible to identify the exact location of the data (‘loss of location’). Remote search and seizure entails searches that are either carried out by extending the initial search and seizure to devices accessible from the originally searched device or by remotely conducting search and seizure from other devices such as the law enforcement’s own. 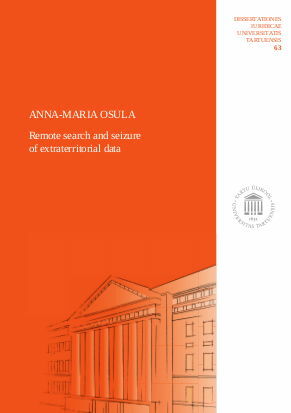 In addition to discussing the traditional mutual legal assistance procedures and alternative measures for accessing extraterritorial data, the dissertation scrutinizes whether remote search and seizure of extraterritorial data entails an extraterritorial application of jurisdiction to enforce and whether it can thereby be viewed as a breach of territorial sovereignty of the other state. This entry was posted in Digital Evidence, Legal Aspects, PhD Theses and tagged Anna-Maria Osula, Christoffer Wong, Jaan Ginter on April 17, 2017 by user469294. The goal of the work is to develop smart cyber security simulation tools. This includes methods, technology and freely available software tools for cyber security simulation that will be applicable to wide set of problems and will be economical and time-efficient, while still providing the required precision. This entry was posted in PhD Theses and tagged Andres Ojamaa on February 17, 2017 by user469294. In this work we provide three scenarios where NIZK arguments are relevant: verifiable computation, authorization, and electronic voting. 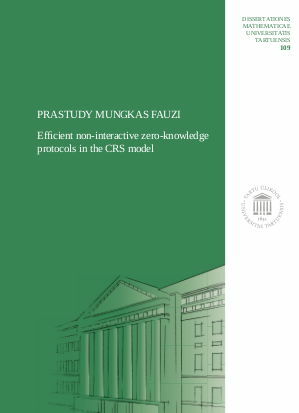 In each scenario, we propose NIZK arguments in the CRS model that are more efficient than existing ones, and are comparable in efficiency to the best known NIZK arguments in the RO model. This entry was posted in Cryptography, PhD Theses and tagged Prastudy Mungkas Fauzi on February 10, 2017 by user469294. In this work, we present solutions for technical difficulties in deploying secure multi-party computation in real-world applications. We will first give a brief overview of the current state of the art, bring out several shortcomings and address them. The main contribution of this work is an end-to-end process description of deploying secure multi-party computation for the first large-scale registry-based statistical study on linked databases. Involving large stakeholders like government institutions introduces also some non-technical requirements like signing contracts and negotiating with the Data Protection Agency. This entry was posted in Multi-party Computation, PhD Theses and tagged Dan Bogdanov, Kurt Rohloff, Riivo Talviste, Stefan Katzenbeisser, Sven Laur on March 3, 2016 by user469294. This work focuses on how to perform statistical analyses in a way that preserves the privacy of the individual. To achieve this goal, we use secure multi-party computation. This cryptographic technique allows data to be analysed without seeing the individual values. Even though using secure multi-party computation is a time-consuming process, we show that it is feasible even for large-scale databases. This entry was posted in Multi-party Computation, PhD Theses and tagged George Danezis, Liina Kamm, Rebecca Wright on February 16, 2015 by user469294. 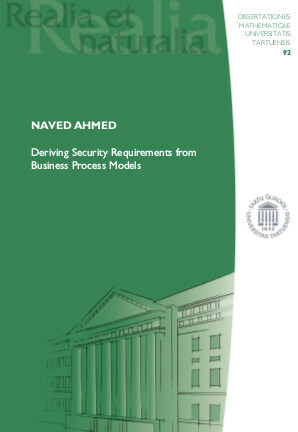 To consider this need, the approach taken in this thesis is to analyse the business process models from a security perspective to derive security objectives and requirements. The thesis has proposed three complementary contributions: Firstly, security risk-oriented patterns that integrate the security risk analysis into business process models. These patterns supports security risk concepts in business process models that business analyst can understand easily. Secondly, the taxonomy for assessing security in business processes. This taxonomy is used to classify the security risk-oriented patterns and helps analysts to apply these patterns in business process models. Finally, these contributions form a foundation for a method, security requirements elicitation from business processes (SREBP) that performs a systematic elicitation of security requirements for their business processes. This entry was posted in PhD Theses and tagged Andreas Opdahl, Marlon Dumas, Naved Ahmed, Rafael Accorsi, Raimundas Matulevicius on December 11, 2014 by user469294.